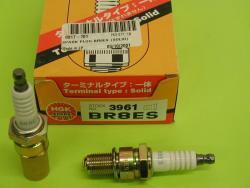 NEW, GENUINE NGK BR8ES SOLID CAP SPARK PLUGS. THESE ARE STANDARD EQUIPMENT ON MOST POLARIS SNOWMOBILES AND A FEW EARLY ARCTIC CAT'S. PLEASE CONTACT US IF YOU HAVE ANY QUESTIONS. YOU ARE BUYING A BOX OF 10 SPARK PLUGS FOR ONE LOW PRICE.